It’s hard to remember a time when we didn’t use the Internet to connect to the world around us. Connecting with friends, completing schoolwork, applying for jobs and many other activities are now done online. The connections that power these services are critical, which is why LULAC has partnered with AT&T to harness the power of the Internet by bringing state-of-the-art technology to community centers across the country. On April 8, LULAC and AT&T re-launched the El Barrio Workforce Development Center in Cleveland. El Barrio was founded in 1990 to meet the needs of a growing Hispanic population on the near west side of Cleveland by two charismatic ministers who realized the need for helping people adjust to life in the Cleveland community. Today, the center employs more than 500 staff who reach more than 25,000 people annually and partners with leading hospitals, educational institutions and capacity-focused organizations to give as many people as possible the chance to build a better future. Friday’s event was an opportunity to build on LULAC and AT&T’s commitment in the digital age– providing community organizations with 21st century technology equipment that will allow them to carry out their missions to connect users to a better future. Through the AT&T Aspire program, AT&T has committed $350 million to helping give every child a high-quality education and their Nanodegree program launched with Udacity provides online, affordable, self-paced courses that teach skills for entry-level jobs in the tech industry. LULAC, through its Empower Hispanic America with Technology program, is supporting a network of 60 community technology centers, providing free broadband access and computer-related training to students, parents, and low income individuals. The emphasis is to empower those without access to the Internet by providing that access and training them on using computers and the internet to do school work, college and financial aid searches, job training, job-searches, managing money, English language courses, and citizenship preparation courses. While the event celebrated the introduction of this new technology to the center, it was also a time to discuss of the importance of technology in securing economic opportunity around the country, which FCC Commissioner Jessica Rosenworcel highlighted in her comments at the opening. AT&T also supported Friday’s event in Cleveland with a training session for the center’s users on managing your digital footprint and using social media safely. The training was part of our Digital You program, created in collaboration with Common Sense Media that can help individuals with privacy, safety and security as you connect online through a series of educational modules provided through the program. Today’s re-opening is a strong example of LULAC’s and AT&T’s commitment to advancing 21st century communications technology by making sure that technology is accessible. This year’s election gives way to a possibility of firsts for the country: the first Latino president, the first woman president, or the first Jewish president. But a first that hasn’t been addressed by the mainstream press is that this is the first presidential election since Shelby v. Holder gutted the Voting Rights Act of 1965. This has left millions of minority voters–including millions of Latinos–vulnerable to discrimination at the voting booth. We are left to ask if Latinos are truly being given an equal opportunity at casting a ballot this election season. In the 2013 Supreme Court case Shelby v. Holder, the Court held that Section 4 of the Voting Rights Act was unconstitutional. Section 4 determined which states and localities qualified to be under the jurisdiction of Section 5, which listed states and counties that had to go through preclearance, a process that required approval from the U.S. Justice Department to change voting requirements. Preclearance was targeted at eliminating disenfranchisement in regions with a history of voter discrimination. Although the Court did not rule on Section 5, by ruling section 4 unconstitutional it essentially made Section 5 null. This gave states and counties with a history of voter discrimination power over deciding who gets to vote and who does not. Nine states, mostly concentrated in the South, and multiple counties in five different states were subject to preclearance under Section 5 of the Voting Rights Act. The consequences of this ruling has created an affront to democracy, as millions of voters can be potentially turned away at the polls because of strict voter ID laws, early voting cutbacks, and registration restrictions. The effects of Shelby v. Holder were obvious in Arizona’s March 22 primary, which dissolved into a complete disaster. Voters in Maricopa County, the state’s largest and most diverse, had wait times as long as five hours because the county did away with 70 percent of polling places. Only 60 polling locations were in place, down from 200 in 2012 when Arizona was still monitored by an intact VRA. Arizona was one of nine states previously monitored by Section 5 because of its discriminatory record against Latino and Native American voters. Even though lines stretched hundreds of people long after the 7 p.m. cutoff time, dedicated voters were undeterred. Aracely Calderon, an immigrant from Guatemala, was the last person in the state to cast her vote 12 minutes after midnight and after waiting in line for five hours. “I’m going to go home very happy and satisfied because it really is a joy to be able to vote,” she told The Arizona Republic.. 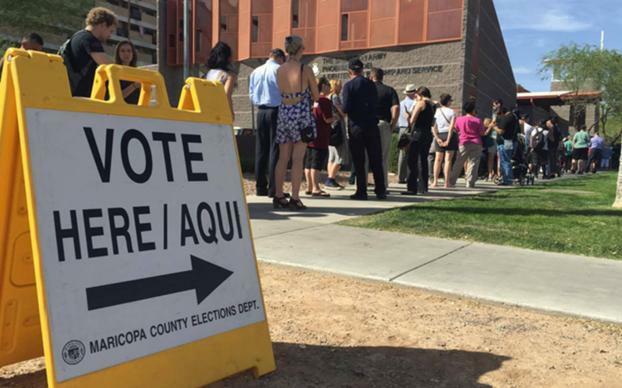 Minorities waiting in line longer to vote is not specific to Arizona. Hispanics report a wait time of more than 30 minutes, six times more often than White voters, and African Americans report extensive wait times four times more often than white voters. In Texas, where strict voter ID laws have been in place since 2011, more than 600,000 registered voters do not have the appropriate ID required. Identification such as college IDs are not accepted, but handgun permits are. In March 2016, LULAC and Rep. Marc Veasy (D TX-33rd District) asked the U.S. Supreme Court in late-March to block Texas from enforcing its tough Voter ID laws for the general election, citing that a 2014 court decision upholding the tough identification policy is outdated and originally meant to be enforced only through the 2014 election. Supporters of the restrictive voting laws in North Carolina charge that not having these policies will lead to the possibility of voter fraud. However, in that state there has been only two incidents of voter impersonation of the 35 million votes cast from 2000 to 2012. Laws are currently in place to protect access to guns and products detrimental to health such as tobacco, yet there is a failure on the part of the U.S. Congress to protect one of the basic principles this country was founded on. It is immoral to try to win elections by preventing millions–usually the most vulnerable–from voting, especially since those advocating for stricter voting laws are the same elected officials who have failed to address the needs and demands of minority communities. Not allowing minorities to have a say in the voting process will engender grave repercussions, especially within the Latino population. Resources will not be allocated to Latino communities if they cannot vote, leading to less investment in education, healthcare, affordable housing, and good paying jobs for Latinos. With the Latino demographic growing, this disparity in resources will affect the entire country’s economic and social landscape. Congressional leaders must implement policies to override the Court’s decision because any alternative is purely counterproductive.